The first retrospective in 25 years of work by artist Garry Winogrand�renowned photographer of New York City and postwar American life�will be on view at the National Gallery of Art, Washington, March 2 through June 8, 2014. Revealing the full breadth of his art for the first time, Garry Winogrand brings together some 190 of the artist's most iconic images�many never before exhibited or reproduced. "Winogrand is widely recognized as one of the preeminent photographers of postwar America, though his work remains largely unexplored and incompletely published," said Earl A. Powell III. "Building on several recent exhibitions of 20th-century American photographers, such as Robert Frank and Harry Callahan, the Gallery is proud to present another major American photographer to our visitors." The exhibition was on view at the San Francisco Museum of Modern Art (SFMOMA) from March 9 through June 2, 2013. After Washington, the exhibition will travel to the Metropolitan Museum of Art, New York (June 27 through September 21, 2014); the Jeu de Paume, Paris (October 14, 2014, through January 25, 2015); and the Fundaci�n MAPFRE, Madrid (March 3 through May 10, 2015). 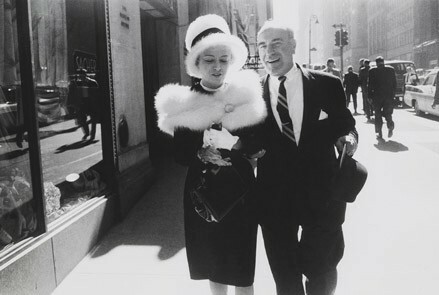 Garry Winogrand is organized by the National Gallery of Art, Washington, and the San Francisco Museum of Modern Art. The international tour of this exhibition is sponsored by the Terra Foundation for American Art. Leadership support is provided by Randi and Bob Fisher. The exhibition in Washington is made possible through the generous support of the Robert and Mercedes Eichholz Foundation. Additional support is kindly provided by the Trellis Fund. When he died suddenly at age 56, Winogrand left behind thousands of rolls of exposed but undeveloped film and unedited contact sheets � some 250,000 frames in total. Many of these pictures have been printed for the first time for this long-awaited retrospective of his work. By presenting such archival discoveries alongside celebrated pictures, Garry Winogrand reframes a career that was, like the artist's America, both epic and unresolved. The exhibition is divided into three sections over seven galleries, each presenting a broad variety of subjects found in Winogrand's art. "Down from the Bronx" presents photographs taken in New York City from his start in 1950 to 1971; "A Student of America" looks at work made in the same period during journeys outside New York; and "Boom and Bust" addresses Winogrand's late period�from 1971, when he moved away from New York, to his death in 1984�including photographs from Texas and Southern California, as well as Chicago, Washington, and Miami. The third section also presents a small number of Manhattan photographs made during Winogrand's return visits; like much of his later work, they express a sense of desolation unprecedented in his earlier photographs. A video of Winogrand at Rice University in the 1970s, edited for the exhibition, allows visitors to experience rare footage of the artist talking to students in a casual, extemporaneous manner. After serving in the military as a weather forecaster, Winogrand began working as a photographer while studying painting on the G.I. Bill at Columbia University (1948�1951). He supplied commercial photographs to such general-interest magazines as Life, Look, Sports Illustrated, Collier's, andPageant. His career was further shaped by the decline of these popular magazines and the rise of a new culture of photography centered in the art world. Although Winogrand was a prolific photographer throughout his career, he largely postponed printing and editing his work, especially at the end of his life. He published five books, but they contain only a fraction of his oeuvre. In his later years he spoke of reviewing and reediting all of his photographs, but he died abruptly, leaving behind more than 6,500 rolls of film (almost 250,000 images) that he had never seen, as well as proof sheets from his earlier years that he had marked but never printed. Winogrand's archive, including his film and proof sheets, is now housed at the Center for Creative Photography of the University of Arizona, Tucson. Garry Winogrand has been conceived and guest-curated by the photographer and author Leo Rubinfien, who was among the youngest of Winogrand's circle of friends in the 1970s. As initiating curator, Rubinfien worked closely on the project with Sarah Greenough, senior curator of the department of photographs at the National Gallery of Art, Washington, and Erin O'Toole, associate curator of photography at SFMOMA. New curatorial research undertaken for this project has enabled the first thorough review of the prints and proof sheets from Winogrand's complete working life. Published by SFMOMA in association with Yale University Press, the 464-page fully illustrated exhibition catalogue is available in softcover and hardcover for purchase in the Gallery Shops. To order, please visit http://shop.nga.gov/; call (800) 697-9350 or (202) 842-6002; fax (202) 789-3047; or e-mailmailorder@nga.gov. Five new essays and some 400 plates trace the artist's working methods and major themes, and create a collective portrait of Winogrand. The catalogue also serves as the most comprehensive volume on Winogrand to date and the first in-depth study of the artist's work, with essays by Rubinfien, Greenough, and O'Toole, as well as Sandra S. Phillips, senior curator of photography, SFMOMA, and Tod Papageorge, Walker Evans Professor of Photography, Yale University School of Art, and Winogrand's intimate friend, prot�g�, and sometime editor. Also included are a chronology and selected exhibitions and bibliography by Susan Kismaric, former curator of photography, Museum of Modern Art, New York. The National Gallery of Art and its Sculpture Garden are at all times free to the public. They are located on the National Mall between 3rd and 9th Streets at Constitution Avenue NW, and are open Monday through Saturday from 10:00 a.m. to 5:00 p.m. and Sunday from 11:00 a.m. to 6:00 p.m. The Gallery is closed on December 25 and January 1. With the exception of the atrium and library, the galleries in the East Building will remain closed for approximately three years for Master Facilities Plan and renovations. For specific updates on gallery closings, visithttp://www.nga.gov/content/ngaweb/Collection/modern-art-during-renovation.html. For information call (202) 737-4215 or the Telecommunications Device for the Deaf (TDD) at (202) 842-6176, or visit the Gallery's Web site at www.nga.gov. Tavernier, French Blue, Hope worn by Louis XIV and Louis XV. Fascinating 300-year odyssey from India, through Bourbon France, the biggest heist ever, to recovery in England, and finally to America as the fabulous Hope diamond. Regent worn by Marie Antoinette. Beginning with theft and murder in India, to a French royal crown, to Napoleon's sword, to Austria, and back to the French Crown jewels. Beau Sancy worn Marie De Medici, oldest diamond ever sold at auction in May, 2013 for $9.4million. An astonishing story from the assassination of her husband Henry IV, pawned in the Netherlands, to England's royals William & Mary, to the House of Prussia. Mirror of Portugal worn by Queen Elizabeth. Famous owners have "ranged from the tenacious to the hapless, the romantic to the cunning," including Phillip II, Elizabeth I, James I, Charles I.
Orlov in the imperial scepter of Catherine the Great. Some say it was plucked from the "eye" of an Indian deity statue in ancient India. Bought by spurned lover Count Orlov and given to the Russian Empress, who had it mounted in the imperial scepter. Koh-i-Noor worn by Queen Victoria. The oldest of ancient stones, it was owned by many Indian dynasties, and was appropriated as reparations by a British diplomat, who presented the Koh-i-Noor to Queen Victoria, and remains in the British crown. Great Table Diamond. George Stuart is creating a new Historical Figure of a person important to the story of the Table Diamond. Taken as plunder by an Iranian Mogul, the diamond disappeared, although there is some evidence pieces exist. Over the last twenty years, Scott Sucher has become known as the world's foremost expert on the technology of documenting and replicating famous historical diamonds. His superb private collection of diamond replicas have been displayed worldwide and are described in detail on his website. He has also appeared on the Discovery Channel and National Geographic Channel, and collaborated with museums worldwide on various projects. On Sucher's bucket list is the opportunity to document and reproduce the Shah and Orlov diamonds in the Russian Diamond Fund. For more than fifty years George S. Stuart has been capturing the essence of history's most famous and infamous personalities in sculptures he calls Historical Figures. Rarely have art and history been melded so exactly in works of such breathtaking realism. The Figures have been exhibited in many museums, the Clinton Presidential Library and the Smithsonian Institution. He has created more than four hundred Historical Figures spanning world history from 1500 to 1900. Many subjects of his Figures have owned or even worn famous historical diamonds. Currently Mr. Stuart is the Curator Emeritus of the Museum of Ventura County, where the Fred. B. Smith Gallery is dedicated to exhibition of his work. (Ventura, CA) - Diamonds Are Forever, a new exhibition at the Museum of Ventura County will tell the fascinating stories of history's most famous diamonds and their equally famous owners, opening in May. The exhibit will feature the well-knowndiamond replicas of Scott Sucher and the stunning Historical Figures of artist-historian George Stuart. The exhibit runs May 2nd through August 24th, 2014. The Museum of Ventura County in Ventura, California will host a fabulous exhibition that will firmly link many famous diamonds to their equally famous and often notorious owners. Scott Sucher's superb replica diamonds will be exhibited side-by-side with George Stuart's remarkable Historical Figures of the famous people who owned them. The exhibit is scheduled to run from May 2 to August 24, 2014. Special activities are being planned during the four-month long exhibition. Artist George Stuart will introduce a new Historical Figure� specifically for the exhibition. The identity of the famous diamond owner will be unveiled at the opening reception on May 2. Stuart will tell the stories of these famous gems and their owners. On May 3, Scott Sucher will present his experiences working with Smithsonian and French art experts to scientifically prove the origin of the famous Hope diamond. For more information, and exact dates, visit the Museum of Ventura website at www.venturamuseum.org, or the Gallery of Historical Figures at www.galleryhistoricalfigures.com. The Museum is located at 100 E. Main Street in downtown Ventura, near the Mission San Buenaventura. Free public parking is available in the lot adjacent to the Museum. For event information and ticket sales call (805) 653-0323 ext. 7. For more information about the exhibit or collaborators, email info@galleryhistoricalfigures.com. The United States' biggest travel show series, the Travel & Adventure Show�, is coming to San Diego for the first time March 29 and 30 and has announced its star speaker line up including: the inspiring and celebrated host of Travel Channel'sGreat Weekends, Passport to Europe, Passport to Latin America and Great Hotels,Samantha Brown; Don Wildman- passionate history buff, museum sleuth and host of Travel Channel's "Mysteries at the Museum," and Patricia Schultz- author of the #1 New York Times Bestseller "1,000 Places to See Before You Die" and "1,000 Places in the United States and Canada to See Before You Die." Apart from the headline speakers, the show will also include a varied selection of destination-specific and travel smart seminars where aspiring travelers can receive detailed, insider information about exotic locales, popular favorites and off-the-beaten track vacation spots. Samantha Brown: The Travel Channel expert will take the audience on a voyage around the globe and speak on how to travel better. Brown's travel goal is to always show that if she can do it, you can do it. No matter where she takes you, Brown will find delectable food, fabulous shopping and an authentic taste of the region you won't find in any tourist guidebook. *Samantha Brown will also be speaking on Sunday, March 30th. Don Wildman: Wildman has made it his mission to uncover some of America's most intriguing events, greatest triumphs, little-known disasters, and even some notorious crimes. As host of Travel Channel's "Mysteries at the Museum" and "MonumentalMysteries," Don Wildman will share his experiences with the audience and bring to light the puzzling and intriguing stories behind historical artifacts and many of the nation's history-rich monuments. Whether traversing obscure or familiar turf, the journeys he recounts are full of fun and surprises. Patricia Schultz: Credited withreinventing the idea of travel book as both wish list and practical guide, best-selling travel author Patricia Schultz discusses some of her favorite destinations from the newly revised 1,000 Places To See Before You Die and 1,000 Places To See in the USA and Canada Before You Die, followed by signing of her books. *Patricia Schultz will also be speaking on Sunday, March 30th. Angel Castellanos, Focus on Traveling Smart: Passionate and experienced Travel Ambassador Angel Castellanos will deliver his acclaimed "Travel Smart" seminar. This informative and popular presentation prepares travelers for each step of the journey (including packing!). Angel will cover the latest TSA rules, packing light tips, safety & security, traveling with technology and much more! No matter your level of experience, you are bound to come away with practical travel tips to help you travel smarter. Jim Cline, Focus on Travel Photography: Jim will reveal many of the secrets and techniques he employs to take his photography to the next level. From planning before the trip begins to arriving back home, he will cover many of the steps in creating dynamic travel photographs, as well as travel logistics with a digital camera and approaching strangers for photos to capture the spirit of a place. Beth Whitman, Focus on Solo Travel: Solo travel can be a frightening thought for many people, but Beth Whitman has learned in her 25+ years of travel that the most empowering moments come when she's faced with a challenge alone. Come learn from this seasoned travel pro how to best prepare for your journey, get past your fears, overcome obstacles and find your courage. You'll learn tips for preparing for your journey, staying safe while traveling solo and how and when to ask for help. Gary Scott, Focus on Adventure Travel: Australian born adventure guide Gary Scott has spent the last four summers hiking, sailing and exploring Croatia, Slovenia and the Dolomites of Northern Italy. Gary will show slides and tell stories about the best places to go in Croatia and Slovenia, and discuss the best hikes in the beautiful Dolomites where he has walked over 100 different trails. Michael Cervin, Focus on California: Join travel writer and radio show guest Michael Cervin as he examines three classic California drives populated with hidden gems, secluded spots, breathtaking vistas and intimate sights, showing a side of California often unknown even to locals. Along the way Cervin points out the unique, unusual and intriguing. Matt Greenham, Focus on New Zealand: Join the destination specialist as he explores the wonders of New Zealand and the amazing diversity of its North and South islands. This South Pacific country is blessed with a phenomenal playground of landscapes that inspires the spirit of adventure in all who visit. Sucheta Rawal, Focus on Culinary Travel/Volunteer Vacations: Sucheta Rawal, founder of the international nonprofit, Go Eat Give will tell you how you can avoid being a tourist and get the authentic experience of another culture, while saving time and money. Michele Bigley, Focus on Hawaii: This session highlights Hawaii's most interesting (and often unchartered) itineraries on the islands. Attendees will also get information on locally owned small businesses in Hawaii that are definitely worth our travel dollars and ways to have an authentic experience on the islands. The session will include how to best plan your time, info on local culture, and insider's knowledge on what you can skip and what deserves a visit. The event's National TV Media Sponsor is Travel Channel. The official newspaper sponsor is the U-T San Diego. Other event media sponsors include AFAR magazine, Sunset Magazine, Jetset Extra, Cuisine Noir magazine, as well as many others. The 2014 San Diego Travel & Adventure Show� will take place March 29 and 30 from 10 a.m. to 5 p.m. (Saturday) and 11 a.m. to 4 p.m. (Sunday) at the San Diego Convention Center, 111 W Harbor Dr., San Diego, CA 92101. Tickets are available online for $10 with Promo Code: SDPR or at the door for $15. Children under 16 years old are free. For tickets and event information, visit www.adventureexpo.com, email info@adventureexpo.com, or call 203-878-2577. Unicomm LLC is an independent business-to-business communications company specializing in originating and managing world class trade shows and conferences. Unicomm's properties include the nation's largest and longest running series of travel events, the Travel & Adventure Show� in Los Angeles, Chicago, Dallas, San Francisco Bay Area, Washington, D.C. and San Diego. The recent boom in the capital�s hotel industry has also caused numerous new restaurants to spring up. Here�s a look at some of the highlights of this season�s crop. Brasserie & Bakery is the name of the new restaurant launched by The Guesthouse Vienna on Albertinaplatz in October 2013. This new eatery in the heart of the historic city center was designed by London-based outfit Conran & Partners, who also planned the elegant boutique hotel that houses it. Radiating timeless, classic understatement, its walls are adorned with quotations in homage to the Viennese coffeehouse. The brasserie specializes in traditional dishes with a contemporary twist, served with freshly baked bread and rolls from the wood-fired oven, as well as homemade cakes and pastries and Viennese Naber coffee. On Vienna�s Ringstrasse, the luxury Hotel Bristol has been gradually upgraded over the past few months without closing to guests, and now boasts an additional ten rooms and suites. Upgrades at the Sacher Group-owned property take the original art deco style of the building (completed in 1892) as their inspiration. Alongside the lobby and the bar, the restaurant was also completely remodeled, and the historic stucco ceilings uncovered as part of the project. 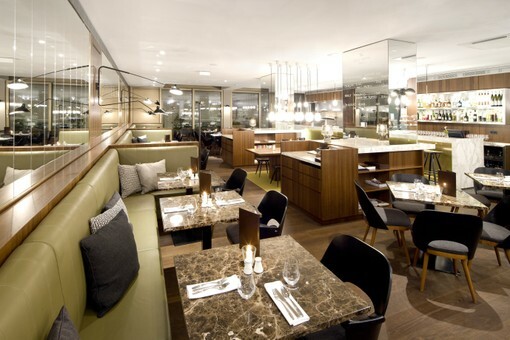 The restaurant and bar at Meli� Vienna in the 22nd district have pride of place inside Austria�s tallest building. 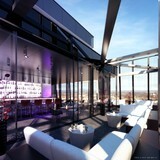 Located in a 220-meter, Dominique Perrault-designed high rise on the left bank of the Danube, this new lifestyle hotel operated by Spain�s Meli� Hotels International group will open in February 2014. While the rooms and suites occupy the lower floors, the Meli� Roof Top Bar is on the 58th and top floor, one above the Meli� Restaurant. Both command breathtaking views of the city below. Siegfried Kr�pfl, who comes to the Meli� from the Hotel Bristol, is head chef. Also due to open in February 2014, new restaurant The Room will be cooking up a storm in a building complex in the third district. The complex also hosts the new Ruby Sofie Hotel (scheduled opening April 2014) and the revitalized 700 square meter Sofiensaal. Originally constructed as a public bathing facility in 1883, it was soon transformed into a ball venue, but was partially destroyed by fire in 2001. The new 200-seat restaurant serves classic Austrian and international dishes, and has private outdoor seating for guests to enjoy during summer. Art and culinary delights are on the menu at The Supper Club in TBA21-Augarten. The event series brings performing arts, cultural exchange and fine food together in one evening, with the thematic focus provided by the individual artists. A total of 11 dates are planned for winter 2013/14. 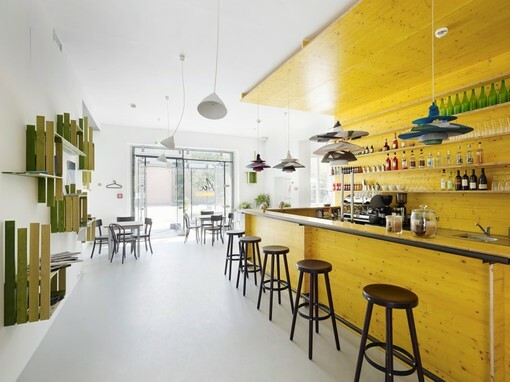 The events are hosted at caf� restaurant Die Au, in the exhibition space used by the Francesca von Habsburg Thyssen-Bornemisza Art Contemporary private foundation in the Augarten park. Campus WU, which opened in the 2nd district in October 2013, is home to several new bars and restaurants. Europe�s largest business campus creates a memorable impression thanks to its architectural highlights, which include the futuristic Library & Learning Center by Zaha Hadid Architects and a range of other buildings created by acclaimed international architects such as CRABstudio London, BUSarchitektur Wien and Atelier Hitoshi Abe Sendai/Los Angeles. Das Campus has put the culinary focus on steaks, burgers and schnitzel, the Scandinavian chic interiors at Nykke provide the perfect backdrop for fresh organic dishes, while Comida y Luz has exotic dishes as well as great views of the campus in store. Steirereck in Stadtpark, winner of two stars (Guide Michelin Main Cities of Europe 2013), four toques (Gault Millau Austria 2014) and ranked ninth out of the World's 50 Best Restaurants (Restaurant Magazine 2013), is currently renovating and expanding. Although the upgrades will not affect customers, the restaurant is set to close its doors for two weeks in February. A new experimental kitchen and a canopy for the terrace are among the new features designed by PPAG Architects. The upgrade is due for completion in April 2014. Renovations are also on the menu at another restaurant on Spittelberg in the 7th district, with BEHF Architekten providing the creative impetus this time. Mario Bernatovic, who cemented his reputation as chef de cuisine at Motto am Fluss, is set to open his own restaurant, Kussmaul, in the district at the end of February. This new high-end eatery will be joined by a caf�, bakery and patisserie. Vienna Tourism is offering the Wien Card (WienKarte) that offers free rides on city transportation in Vienna. Visit: www.wienkarte.at for more information. High heels make you attractive and self-assured. But women are all too aware that walking in high heels is anything but easy. 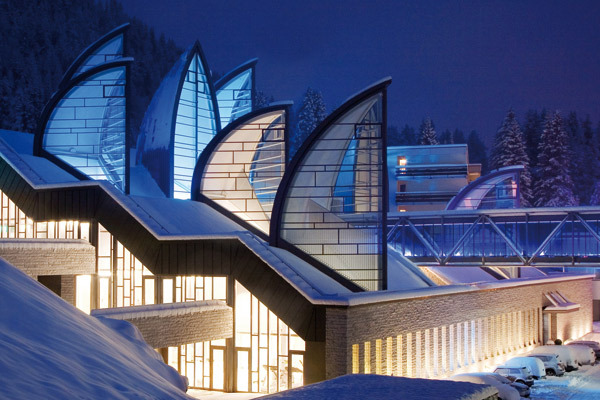 For anyone who wants to walk confidently through life, the Tschuggen Grand Hotel in Arosa now offers professional catwalk training in collaboration with Kristina Joksimovik, the catwalk coach of the Miss Switzerland contest. Another new addition to the range of offers is an exclusive photo shoot against the backdrop of the Tschuggen Grand Hotel with a professional photographer and a hairstyling session in the Tschuggen mountain oasis. These offers are ideal for anyone who urgently needs good pictures for their set cards or who simply wants to take a collection of professional photos home as a special souvenir. And the hair stylists of the Tschuggen mountain oasis show that braids are back in style in their new �braid bar�. With the �Catwalk Training @ The Tschuggen�, organised at the Tschuggen Grand Hotel in Arosa, high-heels coach Kristina Joksimovik introduces participants to the high art of walking. In addition to practising walking in high heels, the programme also deals with improving posture, rehearsing turns, sitting down in a ladylike fashion, removing jackets and blazers in an elegant manner and striking flattering poses for photo shoots. This 90-minute catwalk workshop takes place on 7 March 2014 at 4 p.m. and again at 7 p.m. and is free for hotel guests. The offer is also open to non-residents at a cost of 35 Swiss francs per person. The second new offer from the Tschuggen Grand Hotel is �Tschuggen�s Next Top Model�. Professional portraits will be taken during the guest�s stay at the Tschuggen Grand Hotel while the Tschuggen beauty team in the mountain oasis will create the desired hairstyle and make-up effect to ensure the guest always looks her best. At the same time, the hotel kitchen will serve up a selection of appetisers to be enjoyed with a glass of Prosecco. In the magnificent setting of the Tschuggen Grand Hotel, the professional photographer will then take shots of the guest in her favourite outfits in ten different poses. The photos can then be taken home in CD form as a wonderful holiday souvenir, with three of the photos developed in A5 format. The photo shoot costs 390 Swiss francs per person and the offer can be booked at any time on request. Braids go with any outfit and are now back in fashion. That is why the stylists in the Tschuggen mountain oasis have now introduced a �braid bar� in their hair studio, enabling them to create the perfect style for any occasion. Be it for a wedding, a family celebration, a romantic evening for two or simply to be in vogue, braids are a fashionable addition to trendy clothes. A braided hair style at the Tschuggen Grand Hotel in Arosa is available from 60 Swiss francs and can be booked at any time on request. For bookings and further information, call the Tschuggen Grand Hotel direct on +41 (0)81 378 99 99. These offers can also be consulted and booked online at www.tschuggen.ch. 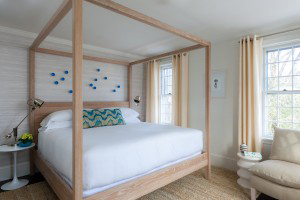 Lark Hotels will grand open its second Nantucket property in July 2014 with the addition of 21 Broad, a totally renovated 27-room boutique hotel ideally located just a minute�s walk from the Steamship Authority and iconic island restaurants. Featuring luxuries such as a steam and massage room, a breakfast juice bar serving gluten free artisan pastries, and unique vitamin C showers, which de-chlorinate the water, 21 Broad will be Lark Hotels' seventh coastal New England boutique hotel and its second collaboration with Boston-based real estate developer, Bruce A. Percelay. It is the sister property to the chic 76 Main, also owned by Percelay, which opened last summer and is the only hotel on tony Main Street in the heart of Nantucket town. Following in the footsteps of all Lark hotels, 21 Broad will feature hip and stylish interior designs integrated seamlessly into the property�s historic foundation which dates from 1876. The interiors at 21 Broad, which are being designed by award-winning Rachel Reider Interiors, will feature a look that fuses an �Urban meets Nantucket - Modern meets Broad Street� feel. Ms. Reider has created the designs for most of the Lark Hotels collection. 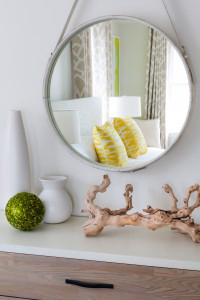 Textures and colors at 21 Broad will blend a �white on white� palette with pops of bold color, plus mixed woods, large striking art, earth toned linens and sea grass. �21 Broad has been the most iconic inn on the entire island for over a century and our goal is to reposition it and make it the most attractive place in which to stay on Nantucket for the next century� said Bruce A. Percelay, owner of both 76 Main and 21 Broad. Guest amenities and services at 21 Broad will include spa services, a guest lounge with game table, landscaped outdoor courtyard with fire pit, iPads and iPod docking stations with a white noise feature, 40� LED Smart TVs, in-room Keurig coffee makers and refrigerators, personalized concierge service, complimentary wireless internet, and exclusive guest discounts for online purchases at vineyard vines, the official outfitter of 21 Broad and all Lark Hotels. Set in six coveted seaside locations � Kennebunkport and Portland, ME, Nantucket, MA, Portsmouth, NH and Newport and Narragansett, RI - Lark Hotels embrace the locations they are in, but in playful, unexpected ways. Think �sense of place� with imagination and a touch of mischief. Each Lark Hotel invites guests to experience modern luxury in the heart of an iconic destination, to feel the pull of a nostalgic getaway while surrounded by today's amenities and to find attentive service when they want it and privacy when they don't. For additional information on 21 Broad, please visit www.21broadhotel or call 508-228-4749. For information on Lark Hotels and the �On a Lark Club,� please visitwww.larkhotels.com. 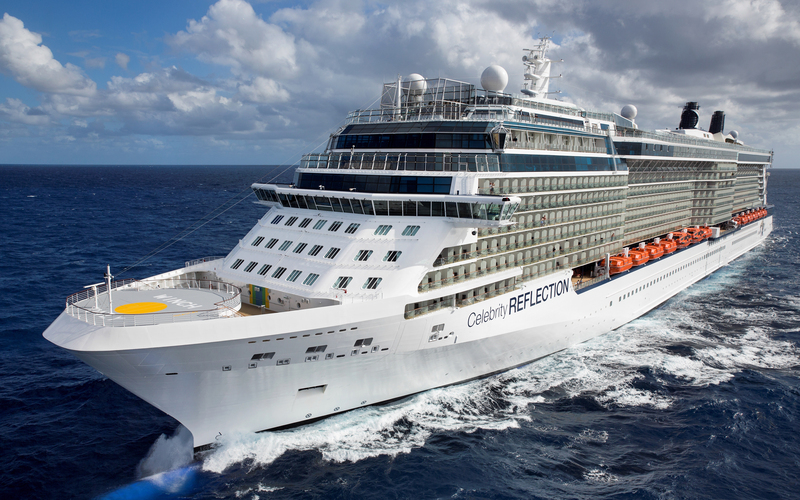 Celebrity Cruises and Canyon Ranch, one of the world�s leading spa and wellness brands, today unveiled a partnership to feature Canyon Ranch SpaClub� at Sea facilities onboard 10 state-of-the-art Celebrity ships. Canyon Ranch and Celebrity will create the largest and most comprehensive SpaClub at Sea offering, and debut exclusive SpaClub services and treatments. The luxurious Canyon Ranch SpaClub on Celebrity Cruises will include spa, beauty salon, wellness and fitness amenities presenting signature Canyon Ranch offerings. The industry-leading brands intend to elevate the onboard experience by introducing exclusive SpaClub treatments and services tailored to the unique preferences of Celebrity�s guests, including new facial and body treatments, and unique yoga and meditation classes. �We are passionate about providing our guests with unforgettable experiences, and this collaboration with Canyon Ranch is an important milestone in our drive to elevating guests� modern luxury vacations,� said Michael Bayley, President and CEO, Celebrity Cruises. "We want every aspect of our vacations � from dining and destinations to relaxing in beautiful spa surroundings � to be special, and the experts at Canyon Ranch will help us deliver on this promise." Both Canyon Ranch and Celebrity Cruises have long been recognized as leaders in their respective industries and have received countless awards. The Canyon Ranch SpaClub at Sea division of Canyon Ranch has been recognized as a �Best Spa at Sea� from various industry publications� readers choice awards, including Cond� Nast Traveler and SpaFinder, Inc., and Celebrity Cruises is consistently awarded top honors by the readers of Travel + Leisure, Cond� Nast Traveler and Celebrated Living magazine. The combination of these award-winning travel brands will result in an unmatchable vacation experience for discerning travelers seeking a taste of modern luxury at sea. The new, robust spa menu features popular Canyon Ranch treatments, such as indulgent facials and facial enhancements, massage, thermal, Asian touch, and Reiki healing energy therapies. A selection of salon offerings, including hair care, nail, and makeup services, will also be offered. Fitness lovers can choose from private consultations to group classes, including yoga, Pilates, cycling, Mind/Body Connection and relaxation � led by Canyon Ranch-trained fitness experts. Wellness programs such as personal exercise prescription, private nutritional consults, acupuncture, Chiropractic therapy and Canyon Ranch Healthy Feet� centers will also be available on select ships. Additionally, Canyon Ranch health experts will provide onboard wellness lectures, workshops and cooking demonstrations. Celebrity�s modern luxury vacations bring guests to inspiring destinations on all seven continents. In addition to its newly enhanced spa and wellness programming, the premium brand welcomes vacationers to experience its luxury �AquaClass� accommodations, which infuse the stateroom experience with additional spa-like elements as well as a host of other extras. AquaClass guests can exclusively dine in the chic specialty restaurant, Blu, and enjoy unlimited access to the Persian Garden, a relaxing oasis with heated mosaic lounge chairs and grottos releasing a variety of dry heat, aromatherapy-infused steam and mists into the air. visit www.celebritycruises.com, or call your travel agent. Canyon Ranch pioneered the evolution of the wellness lifestyle and has been an industry leader for close to 35 years. Operating the world�s most celebrated collection of life-enhancement properties, Canyon Ranch has destination health resorts in Tucson, Ariz., Lenox Mass., as well as Canyon Ranch Hotel & Spa in Miami Beach, the nation�s first luxury wellness hotel and residential community. In addition, Canyon Ranch operates a SpaClub� at The Venetian� & The Palazzo� in Las Vegas, Nev., and Canyon Ranch SpaClub at Sea facilities onboard nine luxury ships. Canyon Ranch has been named the �Healthiest Spa in America� by Health magazine as well as the �Best Spa for Food� by Gourmet magazine. Additionally, Canyon Ranch is a 13-time winner of Travel + Leisure�s Best Spa Award and the only 11-time recipient of the Cond� Nast Traveler Best Destination Spa Award. Small ships cruise line Variety Cruises is offering a 2-for-1 special on the March 9, 2014 sailing of its Treasures of Costa Rica and Panama Canal cruise. When one traveler books the cruise at the regular price, starting at $2590, his or her partner cruises for free. Travelers wishing to take advantage of the special offer should mention "SELECTED SPECIAL" at the time of booking by calling 1-800-319-7776. Variety Cruises, the world's largest small ships cruise company, has been offering passengers worldwide a total yachting experience since 1949. Their fleet of 11 fully-owned vessels varies in size from 4 to 36 cabins. Their yachts and staff provide an intimate and relaxed environment; a comfort filled starting point for the discerning travelers as they visit well known and unique ports of call. Fine locally-flavored cuisine, exciting itineraries and personalized service are just a few of the things that have made Variety Cruises the choice for the ever growing number of travelers looking for distinctive small ship cruise experiences. For more information on Variety Cruises, please visithttp://www.varietycruises.com . Travel to the British Virgin Islands (BVI) from Latin America is easier now with additional flight options. Starting Tuesday, 18 February 2014 Windward Islands Airways International (WINAIR) will provide round-trip connections between Beef Island (EIS) with Copa Airlines via St. Maarten (SXM) three days per week. Copa Airlines flies from several Latin American countries including Argentina, Brazil, Chile, Colombia, Costa Rica, Ecuador, Guyana, Mexico, Nicaragua, Venezuela, and Peru with connections in Panama (PTY) and onto St. Maarten (SXM) four days a week. The Copa flight connected previously only on the inbound to EIS but with the new overnight service on WINAIR, BVI will have round trip connectivity three days a week. Copa Airlines arrives to SXM from PTY at 11:24 AM and departs SXM at 12:15 PM. The daily service on the other days of the week remains as is. WINAIR operates 19-seater de Havilland Twin Otter aircrafts into the BVI. An archipelago comprised of 60 islands and cays, the British Virgin Islands (BVI) are located approximately 50 miles east of Puerto Rico, in the northwestern region of the Caribbean Sea. The main islands are Tortola, Virgin Gorda, Anegada and Jost Van Dyke. Road Town, located on Tortola, is the British Virgin Islands� capital. Renowned as one of the world�s premier sailing destinations, the BVI�s dynamic and vast topography provides a unique opportunity to �island hop� with ease � with each island characterized by its own cultural and natural wonders. Among these attractions are The Baths on Virgin Gorda, Anegada�s Flamingo Pond, and Tortola�s Sage Mountain. Destination highlights also include world-class yachting, snorkeling, hiking, sustainable tourism and, for diving enthusiasts, the Caribbean�s most stunning wreck dives, such as the RMS Rhone. A pristine and romantic island paradise evoking a bygone era, the British Virgin Islands are nonetheless easily accessible for U.S. travelers flying into Tortola/Beef Island�s Terrence B. Lettsome International Airport (EIS) via frequent connecting service from nearby Puerto Rico, St. Thomas, Antigua, St. Kitts or St. Maarten/St. Martin. Visitors traveling to the BVI from St. Thomas can also travel via ferry. Despite its status as a United Kingdom territory, the BVI conveniently uses the U.S. dollar as its official currency. It�s a Deal � It�s fashion forward and � It Works! Socks are a must for savvy travelers, and this company has great looking, and very comfy socks to take along when you are on the go. Sock Panda was started in 2011 to change the way people see, buy, and wear that most overlooked article of clothing: socks. They believed there�s more to it than simply black or white - They believe there�s unparalleled opportunity. With their choice of socks, people can express themselves easier and cheaper than with any other piece of clothing. That�s why they search the globe to hand-pick the very best in sock styles - the finest fabrics, boldest colors, most daring designs - and curate an ever-changing assortment for their customers. Simply tell them your style preferences and they will send you awesome new pairs every month, saving you time and money with their dedicated, personalized service. They say If you�re unsatisfied for any reason, or if people don�t stop you to say, �Nice socks,� you can send the pair back to them and they will get you a replacement. It�s simple and it works. People have stopped me to comment on how cute my socks are, and they coordinate with whatever you are wearing. From their headquarters in Venice, CA the Sock Panda team are working to redefine a sometimes overlooked but crucial part of your wardrobe, and they seem to enjoy helping people put their best foot forward one fantastic pair of socks at a time. Stylish stuff for your home this spring!